The Supermarine Spitfire PRXIX was the last Photo Reconnaissance Spitfire produced and was the only Griffon powered reconnaissance Spitfire. 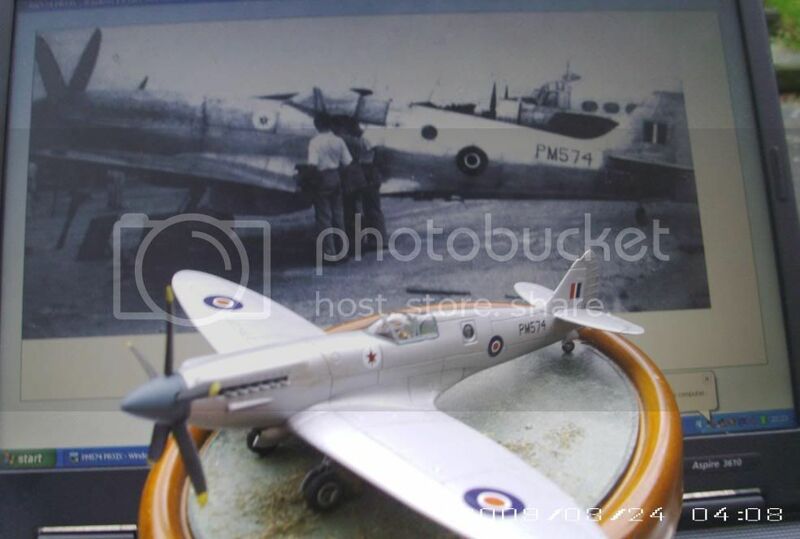 It was produced by taking the Mk XIV fuselage, adding the PR Mk XI wings and PR Mk X cabin. The first 21 aircraft were un-pressurized and powered by the Griffon 65 engine, whereas the remainder were pressurized and powered by the Griffon 66 engine. The PR Mk XIX It could carry 254 gallons of fuel internally, using space in the wings that had originally held cameras. It could also carry a 170 gallon drop tank, although this was limited to 90 gallons on operations. It had a top speed of 445 mph and a service ceiling of over 42,000 feet, putting it out of the range of Luftwaffe. The PR XIX could carry two vertical and one port side oblique camera, the vertical cameras were either F8s with a 14 or 20in focal length or F52s with a 20in focal length. The oblique camera was an F24 with either an 8 or 14 inch focal length. Packed in a the new red boxing with a computer generated image of the Spit on the cover that Airfix have now adopted, over the classic paintings that they used to have (sheds a tear to see that gone), the contents are bursting, no thanks to the size of the instruction sheet (I thought Rowan was exaggerating with the Bf-109 review). The kit comes on 5 light grey sprues with 41 parts and one clear sprue consisting of 3 parts, which are bagged separately. Now as this kit is a new tooling, its a true PR XIX, and not a mix and match of different kits. There is no flash and pin marks, which are mainly on the larger pieces are in places that won't show. Cockpit detail is adequate and simple. The seat has no harness's, as they are on the pilot figure. The pilot is in three parts (body and two arms), and is better then the old Airfix kit pilots used to be. The only criticism with the pilot would be his size, he just looks too small for 1/72nd. The instrument panel is just a blank face, which wouldn't be to bad if Airfix supplied a decal for this part, but they don't. A little sidewall detail for the cockpit on thee inside of the fuselage halves in the form of raised surfaces should look pretty good when painted. Wheel-wells are just holes in the lower wing, and may need a little filling to box them in a bit, and internal detail is non existent. The undercarriage legs and doors are one piece and have a bit of detail moulded into them. The wheel hubs and tyres are one piece and you get a choice of two types, 3 aperture and a 4 aperture wheel hubs. If modelling the aircraft in flight mode, Airfix supply a set of wheels and doors that are inserts, which should make that a bit easier, then having to trim doors to fit. 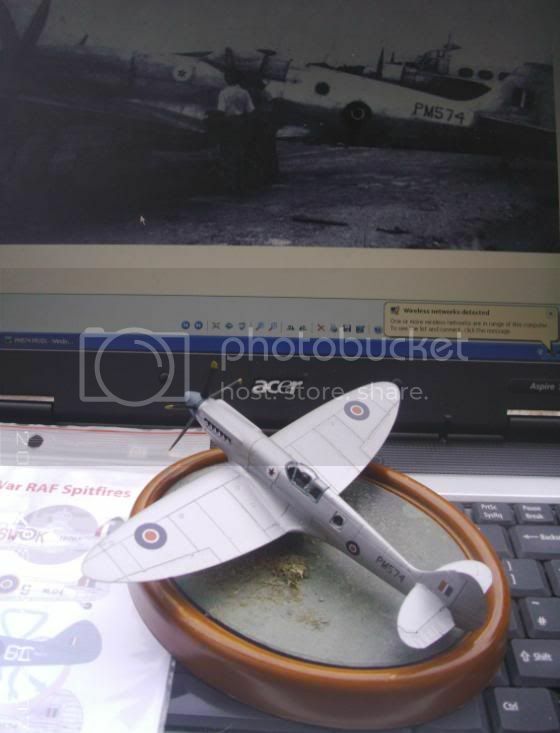 Airfix have noticed that Griffon powered Spitfires have a retractable tail wheel, so the kit does come with a couple of doors for the tail. No stand comes with the kit, unlike the old days of Airfix, where you got one whether you wanted it or not lol. The camera ports are all ready drilled out, but no camera's are supplied, so you will be left looking into a hole. Painting the interior black should hide the "emptiness" a little. External detail is in the way of recessed panel lines which are a little heavy, but at least you won't have to fill any gun or door panel lines. The rudder comes as a separate piece, so modelling it off center is possible but the rest of the control surfaces are moulded in the neutral position. The exhaust stacks look a little thin to the eye, but should just about pass. The clear parts are a little on the thick side, but are pretty clear with no discrepancies. The canopy is moulded as one piece, so modelling the canopy open will require some surgery. The canopy is the blown type used with the later pressurized PR XIX. As stated before the instructions are huge, printed on an A4 size sheet of paper, the instructions fold out into a three page sheet. When i first opened this kit I thought Airfix had forgotten to put the plastic parts in the box as all I could see was the instructions lol. The build sequence is broken down into 11 stages and is simple and straightforward to follow. Internal colours are given along the way for Humbrol paints. The paint and decal guide is a separate A4 size colour sheet with all four profiles of the two aircraft that can be modelled. PR.XIX, PS888, 81 Squadron, RAF, Malaysia, April 1954. PR.XIX, 31040, 1 Division Flottilj 11, Swedish Air Force, Flygvapnet based at Nykoping, July 1955. The decals are in register, a little on the thick side (but not much), very little carrier film, and only the basic markings are included. Highs: Simple, cheap, ready to build kit. A true PR XIX, not a mix and match. Lows: Maybe a little to basic for some. Verdict: Airfix doing what Airfix does best, producing a nice little kit which should encourage modellers of all ages and skills. ..just finished my first one, using the Freightdog Models 'Post-war Spitfires' sheet, ten subjects for £10, great value..plenty more to come..